The Viper Label lays on a collective gathering at the Palm House, Getintothis’ Liam Fay finds a bright new spark but finds a Liverpool cult legend distinctly out of sorts. A lot has been written and said about Edgar ‘Summertyme’ Jones. Much of it positive. Much of it talks about how much of ‘legend’ he is in Liverpool music circles and how Johnny Marr is a fan. So with at least 20 years’ worth of hype and praise Getintothis arrived at the Sefton Park Palm House with high expectations for the evening as The Viper Label put on a showcase of some its talent. Unfortunately we found ourselves frustratingly bored and on the edge of slumber by the end of Jones’ set. 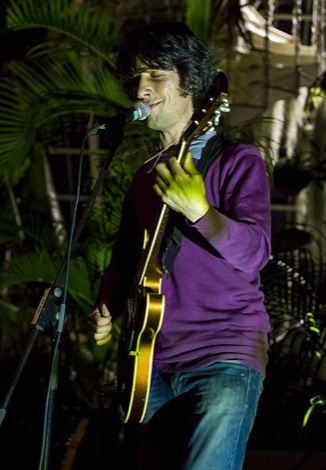 That’s not to say that the evening was a bust though with TG Elias (main picture) putting in a beautifully delicate set. With tables and candlelight beneath a sensual south Liverpool sunset and the swaying of trees in the breeze the evening turned into a very gentile one. 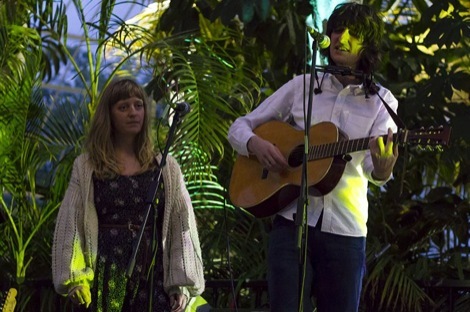 Staging a rare gig of this kind the Palm House peaked our interest; what is essentially a an enormous greenhouse has its stage set in the middle of the circular floor under the gaze of some equally enormous foliage. Slightly unwieldy and unsympathetic, the structure can overwhelm when a lonely performer takes to it. There were no problems with the sound, however, with even the whispery vocals of TG Elias being heard at the very limits of the floor. Elias was by far and away the pick of the evening. He may well be the love child of Bob Dylan, Ray LaMontagne and Neil Young (we’re sure that’s possible, we love science). Armed with a guitar, harmonica and a backing vocalist he spins out a gentle, blues soaked set. Beneath the gaze of the aforementioned giant palms he appears ten feet tall despite all of his self-consciousness and apologetic nature. While other performers crowd the microphone and enunciate to ensure they can pierce the babble of the unwashed masses Elias instead opts to stand at least a yard away and offers his lyrics up softly to the mic. The result is a tender one as he generates an overwhelming sense of safety in this fragile glass shelter from the elements. The set has an easy rolling quality and the wailing melodies are breath taking. You’d love for him to play just for you. Pure As The Driven White Snow is the best effort of the night. It’s a catchy, foot tapping, country track which treads its’ path lightly into your head and stays there for days. Edgar Jones closed the evening with a set heavy on inflections, guitar noodling and lots of head nodding, primarily from himself. He rattles through his repertoire and with minimal crowd interaction, however, you sense few are listening as people begin to leave or lose themselves in chatter. The set does pick up at the very end as Jones is joined on stage by a collective of musicians which gives his performance at least one positive. We are treated to a deep south tinged flurry as an extra, necessary, guitar gives Edgar’s sound some much needed OOMPH. He sadly ruins this by howling forlornly into the glass ceiling. 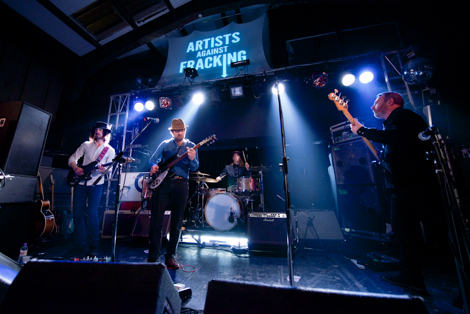 Getintothis reviews the Liverpool International Festival of Psychedelia feat Edgar Jones.